Samsung HT-F6500 review | What Hi-Fi? One-box home cinema systems have always represented value and simplicity. 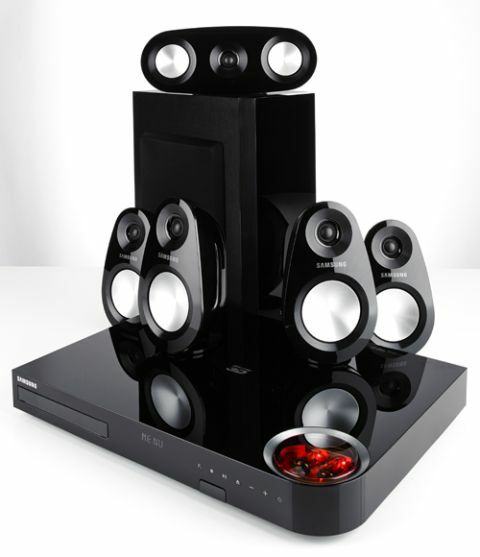 But finding just five speakers and a sub for £430 is tricky – let alone a set that includes a surround amp, 3D Blu-ray player and all the cables. It’s with that value in mind that we unbox the HT-F6500. The speakers are fairly stylish and well made. Plastic dominates, but it’s solid and glossy. Less effort’s been made with the sub, which is an (admittedly relatively slim) MDF box with a sticky-out grille on the left. Calibration isn’t included, so it’s worth going to the menus for tweakage.There’s no mic-driven setup, so have a sound-meter app handy on your phone. It’s also worth turning off the Equalizer and Dynamic Range Control. You’ll thank us later. The simple home menu has three main areas – Films and TV Shows; Apps; and Photo, Videos and Music. Then there’s a row of shortcuts to ITV Player, BBC iPlayer, Knowhow Movies and the web browser. That gives you a lot to take in before you even put a disc in. The Apps section is crammed with services, and if video-on-demand is your thing you’re not going to be disappointed. Practically every base is covered – including Netflix, LoveFilm, and catch-up services. There are the seemingly requisite but probably never used Twitter and Facebook apps, and while Spotify is missing, Napster is on board. The Films and TV Shows section is more disappointing. Rather than bring in movies from all of the services, it only shows content from Samsung’s own Video Hub. That’s fine in terms of movie catalogue, but it is almost entirely standard-def and has just one TV show – a single episode of Scooby-Doo. Got a bunch of your own media files? The Samsung is happy to oblige – standard-def AVIs and HD MKVs are played across a network without stutter, and even 24-bit/192kHz FLACs are supported. Impressive stuff for a home cinema in a box, especially at this price, even if the menu system is a little sluggish and basic. But it’s in the performance where the affordable nature of the system shines through. Play Avatar’s Thanator chase scene and there’s initially little to complain about. Treble is controlled and bass is integrated nicely so that nothing sticks out. Voices come through clearly and surround effects are placed pretty effectively. The problem is that it lacks atmosphere and action. The speakers sound a bit lightweight and want for dispersion, and don’t have the dynamics necessary to go from the quiet build-up to the loud attack with the conviction necessary. Picture-wise, too, it seems fine at first, but comparison with the strongest rivals shows there’s better detail elsewhere, while colours are a touch richer than is natural. And if you’re going to take advantage of all of those music features (it plays CDs and connects to iOS and Android devices too) you’re also going to have to put up with a slightly lacklustre delivery. There’s nothing here to cause upset; it simply doesn’t have the body, dynamics or detail of the best. If your budget won’t stretch, give it a demo – but bear in mind its limitations.